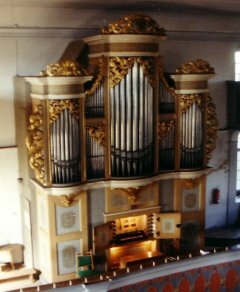 The virtual Gottfried Silbermann organ of Großhartmannsdorf (1741, II/P/21). Please also have a look at the licencing conditions listed in the requirements tab. Unfortunately for this sample set we have to exclude public performances or installation in public places. We ask for your understanding in this matter, it was a requirement to get permission to sample this beautiful instrument. We think that customers should have the opportunity to try our sample sets as much as possible before making a decision to purchase, hence a free trial version is available for download here. This trial version is fully functional except that the sound will be interrupted for a few seconds about once every minute. Please note that the download is a 2.5 GB file. If you would like to read some more information about the sample set, you can download the included PDF-booklet here. A nice review of this set including some demo recordings can be found on the PCOrgan website. Another review (German only) can be found on the Orgelbits Website. This sample set makes one of the finest remaining Gottlieb Silbermann organs available for Hauptwerk. It has been sampled by Peter Ewers for his Gigastudio pipe organ series "Symphonic Organ Libraries" in 2001. Please have a look at the 'Details' tab for more information about the organ and the sample set. The Gottfried Silbermann organ in Großhartmannsdorf has two manuals and pedal with 21 stops. It comprises 1178 sounding pipes, the prospect is completed by 26 silent pipes. The organ case is 5,50 m tall and 4,30 m wide, the middle tower of the prospect shows the emblem of the church patron, who signed the contract with Silbermann and paid a substantial part of the cost of the instrument. The organ was inaugurated on the 3rd December 1741. 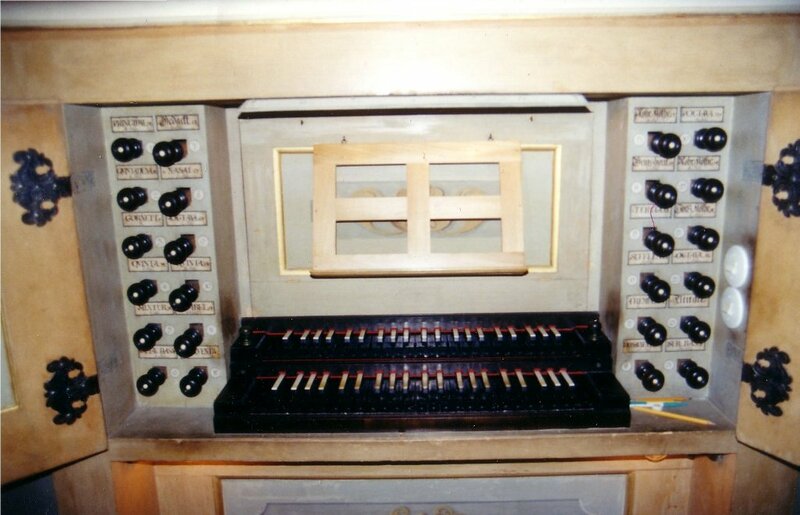 This instrument is one of the best preserved organs of Gottfried Silbermann, it has been well maintained but never been modified significantly. First repairs had been carried out by Adam Gottfried Oehme from Freiberg in 1780, further works by Gebr. Jehmlich from Dresden. Since 1952 the organ is maintained by Eule Orgelbau from Bautzen. It is not known at what time the temperament of the organ has been changed. It is now tuned to equal temperament, but still nearly a full note higher than todays concert pitch. Analysis of the samples shows a tuning with a1=462 Hz. Many recordings are available with this instrument, mostly with works by J.S. Bach. The organ has a very bright and clear sound, which is typical for the instruments of Gottfried Silbermann. The sample set is encrypted, but it still can be used with the Hauptwerk Free and Trial versions. The compass is extended up to g''' in the manuals and f' in the pedal. There is a switch to toggle between extended and original compass. This is mainly because some of the stops are repeating, and for the extended compass they break at c'''. The tremulant can be switched to work as in the original, effecting the entire organ, and to only effect the OW, which makes it much more useful. The organ is tuned to a pitch of a1=460 Hz. A switch is provided to easily switch this to the standard pitch of a1=440Hz, without loading a different temperament file or using the HW tuning feature. There are two settings for the wind model. One is as unstable as the original, the other is more stable. Naturally you can also adjust using the organ settings menu. (Unfortunately only non US customers can benefit from that). This sample set requires HW version 3.2 or greater. Note: This sample set is compatible with the Hauptwerk Free Edition! However, when playing fast sequences of chords with full tutti the available polyphony of the Free Edition is not sufficient and the reverb tails do get cut off. §1) This agreement defines the licencing agreement between Pipeloops (Reiner Suikat) and the user of the sample set „Silbermann organ of Großhartmannsdorf“. The sample set consists of the samples and, depending on the version, images, database and other files. It is available as a download or DVD version. 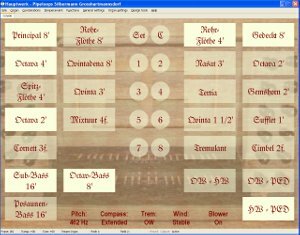 §2) Pipeloops grants the customer the perpetual right to use the sample set with Hauptwerk, the Virtual Pipe Organ software of Milan digital audio (former of Crumhorn Labs). Pipeloops retains all rights, including all copyright and intellectual property rights, to the sample set and all copies thereof. §3) The customer must not use the sample set for public performances and/or recordings without written permission from us. §4) The customer is allowed to make a backup copy of the distribution media as needed. However, the customer must not distribute copies of the sample set or parts thereof to third parties. §5) The customer may resell the sample set. In this case the customer must sign a written statement that he has has handed over the distribution media and all copies to the new owner and that he has deleted any files associated with the sample set from his computer and send this statement along with the name and address of the new owner to Pipeloops. §6) The sample set comes without any warranty. Pipeloops can not assume any liability for the use of the sample set. The customer has to take the usual precautions when evaluationg the sample set, such as setting speakers to a low volume during the first tests. The audio signal reaching the speakers is determined by a number of factors, e.g. volume settings on the PC, settings on the sound producing software, the sample set itself and the input signal (e.g. midi-file). §7) The free trial version may be used for evaluating the sample set for a period of 30 days. After this time the user must either purchase a license to continue using the set or remove it completely from his computer. This sample set can only be installed in Hauptwerk after accepting the agreement. New recording! Played live using Hauptwerk by Anton Doornhein and kindly made available to us. As usual no sound processing has been applied to the recording. Here are the first live demos with this sample set. These demos are played live by Bert den Hertog. The sound has been recorded directly from Hauptwerk, no post processing has been apllied. Virtual Baroque von James Pressler started a Mini-Concert Page for this Instrument. Here you can find a growing collection of nice pieces showcasing this sampleset. You can find more sound demos in the review on the PCOrgan website. Please click on the small arrow at the right hand side of the selection field below to show the available options. You can select an option by clicking on it. Prices different from the product's standard price are shown in the selection list as well.